Just quickly, I would like to share with you this refreshing sorbet I churned a couple of weeks ago. The basil adds such a POW of freshness to the strawberries. Imagine an intermezzo, a brief interlude, in between courses to cleanse your palette with aromatic cooling freshness. It's also, or more accurately, primarily, a great delicious summer frozen treat. This particular sorbet didn't come out icy, though I had to stick the scooped cone in the freezer, so it wouldn't melt quickly as I photograph it. The consistency was a smooth, idyllic, epitome of a sorbet. I will be somewhat absent in the next couple of weeks but follow me here. I will be Instagram-ing. Wishing you all a great summer and to those of you who are experiencing winter, take solace that you are not enduring the humidity here. In a bowl with a lid, add the sugar and the basil to the strawberries, mix, cover with a lid and let macerate in the refrigerator for at least 4 hours. Best to macerate overnight. Stir once or twice while macerating. Add to a food processor and whizz to a smooth consistency. Churn according to manufacturer's instructions, scoop to a container with a lid and freeze for at least a few hours. Let thaw a tad before serving. 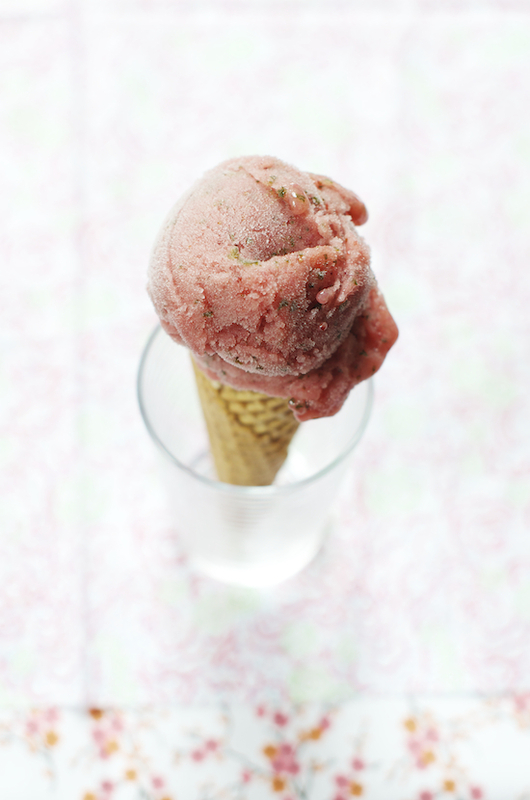 *I wouldn't recommend using less than 1/2 a cup of sugar as it contributes to the smooth consistency of the sorbet. So refreshing! A delightful fragrance. how was I not already following you via instagram? I am now, hope you have a nice break! TY Kristina. It's an easy peasy recipe. So simple. So fresh. Se decadent. I want one now! 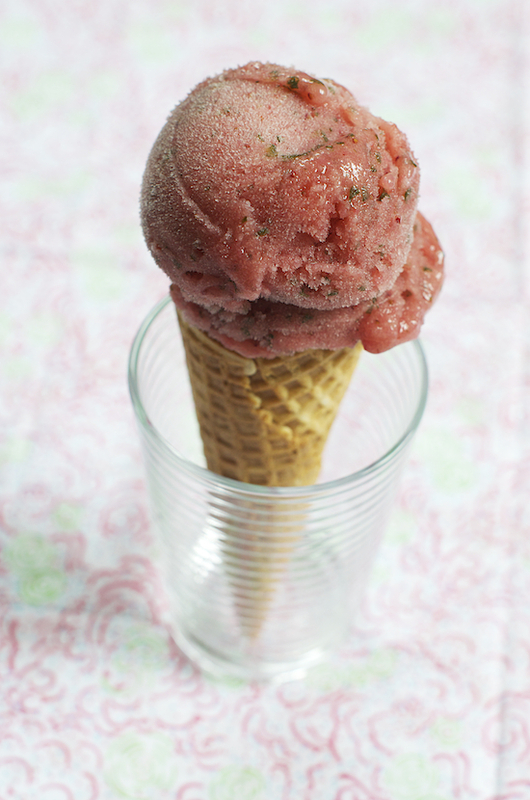 I love strawberries with basil, such a refreshing sorbet! It's really super easy, Anusha. You should give it a go. I never buy anymore. You are signing off with this fresh dessert. Enjoy your time off. I know how it is to click sorbets and icecreams, you have done a great job. אבל חייבת להגיד שאף פעם לא ניסיתי לשלב בזיליקום במתוקים ובטח שלא בגלידה. כן לקח לי שנים לשלב כוסברה בזיליקום ןכד במאכלים מתוקים. כנראה שהפכתי לאמריקאים חחחח:) אבל באמת שזה טעים. I'm in love with the gorgeous simplicity of these photos - the recipe looks fantastic as well! TY sweet Nelly, It means a lot! What a pretty scoop and fantastic flavor combination as well! Great minds think alike. We recently made some too!! Tastes so good!!!! So gorgeous Shulie, I will make it and stare at it! Basil is so pungent and wonderful. 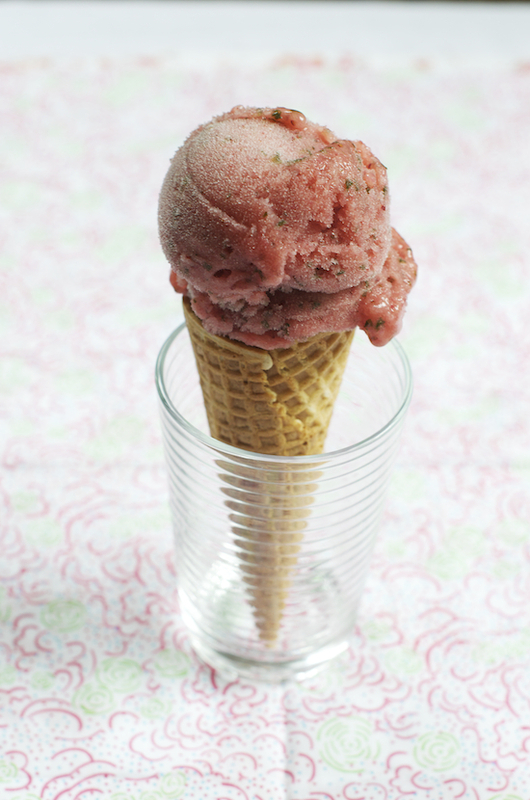 I love sorbets and this recipe sounds like a particular good one. And where you talking to me regarding the humidity?! jaja! Have a great time wherever you´re going!